Full list. 708 DVD threshold, 681 BD. 13 37 1,548 1,548 1 Funassi no Funafuna Biyori: Nashi Matsuri Nasshi! 19 57 66 1,106 135,716 25 Youkai Watch: Tanjou no Himitsu da Nyan! Owarimonogatari v1 sells 20708/2710, total 23,418. 10/15% overestimated. Lowest Monogatari v1wk1 by a solid margin. Previously that was 27,652 for Tsuki v1, which itself is more than 2k below the third lowest. The lowest total volume sales for any of the 27 prior Monogatari discs is 33,622 for Tsuki v2 which seems way out of reach for Owari. So this will almost certainly be the first sub-30k Monogatari volume. …All that said, it’s still twenty-three-frickin-thousand, so, that’s Monogatari for you. Gochiusa v1 sells 10468/2041, total 12,509. 9/21% underestimated. Event ticket in both this and v2. s2v1 is going to beat s1v1 for sure, it’s within 509 discs already. Another 10k average looks pretty likely. G Tekketsu v1 sells 8398/856, total 9,254. 6% underestimated/20% overestimated (BD/DVD). Discounted v1, and I think it has a code for the Vita game. Might be a large drop after this? One Punch Man v1 sells 6059/2828, total 8,887. 8/29% overestimated. Overestimation was entirely expected, so this looks about right. Should reach 10k. Event ticket boost. Starmyu v1 sells 4320/3887, total 8,207. 78/17% underestimated. Ought to be a 10k v1, and v2 has an event ticket too. The drop after that will likely be huge, but strong start. Fafner Exodus s2 v1 (v7) sells 5891/836, total 6,727. 16/40% overestimated. It’s split cour and they’re even maintaining volume numbering (though there was a gap), so no surprise that it’s selling on par with the last few s1 volumes. Shinmai Maou s2 v1 sells 2770/727, total 3,497. 22% over/4% underestimated. Rakudai Kishi v1 sells 2318/531, total 2,849. DVDs from extended. 10/24% overestimated. Owari no Seraph s2 v1 sells 1543/1043, total 2,586. 10% under/11% overestimated. Lupin Part IV v1 sells 1823/648, total 2,471. DVDs from extended. 31/34% overestimated. Asterisk v1 sells 1706/494, total 2,200. DVDs from extended. 30/11% underestimated. Dance with Devils v1 sells 928/937, total 1,865. 43/20% underestimated. Aria AA v1 sells 1142/327, total 1,469. DVDs from extended. 13% under/26% overestimated. Hacka Doll v1 sells 1,155. 4% underestimated. BD-only release. Heavy Object v1 sells 966 BDs, DVDs do not rank. 9% underestimated. Kagewani v1 sells 933 as a DVD-only release. 31% overestimated. Young Black Jack v1 sells 416/471, total 887. Both from extended. 89/147% underestimated. Taimadou 35 v1 sells 528 BDs, DVDs do not rank. BDs from extended. 20% overestimated. Sakurako-san v1 sells 512 BDs, DVDs do not rank. BDs from extended. 44% overestimated. Somera-chan sells 281 BDs, DVDs do not rank. BDs from extended. 32% overestimated. One-shot release so this is the “average” as well. Overlord v4 sells 8707/1325, total 10,032. Symphogear s3 v4 sells 8200/828, 9,028. Gate v4 sells 4372/880, total 5,252. TLR Darkness s2 v5 sells 4041/932, total 4,973. Non Non s2 v4 sells 3,941 BDs, DVDs in the full or extended rankings. Hetalia s4 v3, final volume, sells 3,896 as a DVD-only release. Series average: 4,877. Should end around 5-5.2k. Season one did 23,287. Season two did 10,364. Season three did 7,066. Prisma Ilya s3 v4 sells 3264/316, total 3,580. DVDs from extended. Prison School v4 sells 2835/675, total 3,510. DVDs from extended. Ushio to Tora v4 sells 1886/599, total 2,485. DVDs from extended. Durarara x2 Ten v5 sells 1194/693, total 1,887. DVDs from extended. Shimoneta v5 sells 1,761 BDs, DVDs do not rank. Shirayukihime v4 sells 1064/654, total 1,718. DVDs from extended. Junjou s3 v4 sells 729/851, total 1,580. Joukamachi v4 sells 1,152 BDs, DVDs do not rank. Gatchaman s2 v4, final volume, sells 972 BDs, DVDs do not rank. Series average: 1,173. Down from 7,317 s1 (over 10k with re-release). Ouch. Deremas v7 sells 7558/691 standalone, 13699 G4U, total 21,948, standalone DVDs from extended. Kurobas s3 v9, final volume, sells 7563/8133, total 15,696. Some kind of boost this volume, currently third highest after 1-2. Series average: 15,187. Should end around 15.5-16.0k depending on whether there’s some boost to previous volumes. Season one averaged 24,470 and season two averaged 18,722. Season three held up pretty well compared to s2. HS DxD s3 v5 sells 4024/1116, total 5,140. Danmachi v7, final volume, sells 4009/713, total 4,722. Series average: 5,125. Grisaia s2 v5, final volume, sells 2910/555, total 3,465. DVDs from extended. Series average: 3,581. Yuki-chan v7 sells 1432/300, total 1,732. Shokugeki no Souma v6 sells 1193/356, total 1,549. DVDs from extended. Plasmemo v7, final volume, sells 1,433 BDs, DVDs do not rank. Series average: 1,959. Ninja Slayer v4, final volume, sells 1,289 BDs, DVDs do not rank. Series average: 1,564. Akatsuki no Yona v8, final volume, sells 1178/941, total 2,119. Series average: 2,759. Aria s1 BD Box sells 14,336. It actually managed to beat its 13,289 estimate, which is pretty amazing to me, since I expected it to be really Amazon heavy due to the Amazon edition. Straight to ¥358m and #23 on the list. Super happy about this. Strike the Blood OVA v2 sells 9401/2318, total 11,719. Already within 4% of v1, so this is quite a successful OVA, considering it’s doubling the TV series average. Tokyo Ghoul OVA v2, final volume, sells 874/681 BDs, 414/453 DVDs, total 2,422. Series average: 2,649. Accel World BD box sells 838. Love Live movie adds 12672/1269, total 216,238. Everything in the universe releases last week, this week everyone takes off for the holidays. Even the two that are coming out are at the start of the week. Still waiting for the full list to come out for this week. It’s delayed by the holidays. Sales for those will be low though as GitS has been released multiple times before already and this release isn’t discounted in price at all from the one a few years ago. Any update on god eater v3 sales? See the comment above yours. 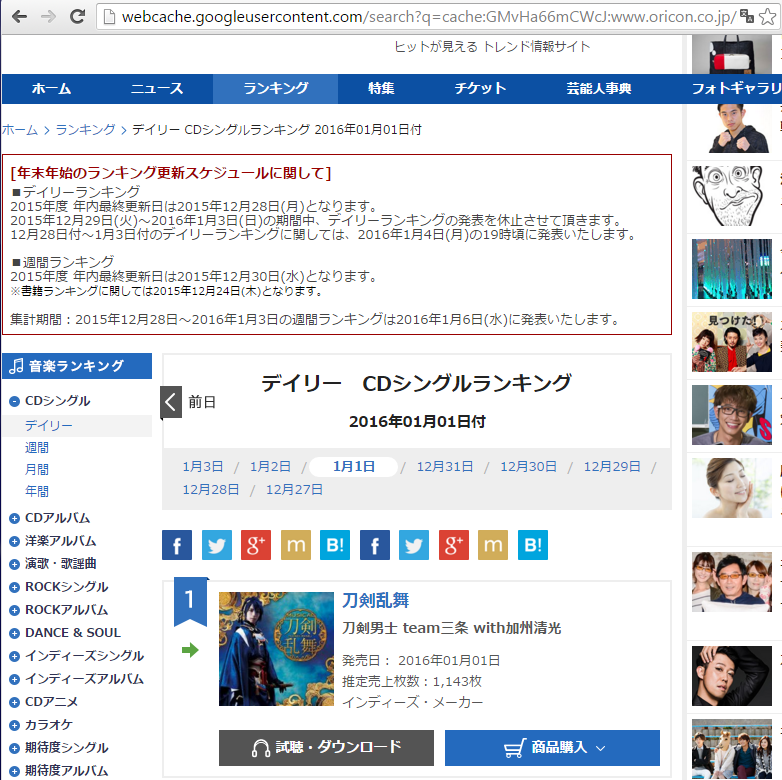 Oricon full list not out yet. Last week’s Media Create data (which would have the Offshoot bundle) is only out in partial form, however Offshoot v3 doesn’t appear in either the MC or Famitsu top 30. Thresholds are high given it’s the end of the year, so we probably won’t get data for the bundle this volume. Media Create list is out. They only show numbers for the top 20, names down to 50. God Eater Offshoot v3 is outside of Media Create Top 50 completely (threshold = 12,188 at #20) and Famitsu Top 30 (threshold = 8,598 at #30). Hopefully future volumes won’t face such thresholds and we can have a Offshoot number that isn’t based on a single (and potentially misleading) number. This series is hilariously biased towards the bundles (6,507 vs 827 wk1 for v2? uhhh) so I’m not sure they give a very accurate representation. IDOLM@STER Cinderella Girls v7 sells 13,699. Very consistent the last three vols (13.3 > 13.6 > 13.7). Volume total is 21,948. Average is 29,894 with two volumes left. Unlike God Eater, Deremas has been pretty evenly split half standalone, half G4U bundle. Still no full Oricon data for the week of 12/21. And still no prelims for the week of 1/04. I got up at the normal time, checked Youtaiju for 15 minutes. Gave up and just checked again after another hour. Still nothing. I cna’t keep checking since i need to be up for work in a few hours, so if it gets posted today I won’t get to it until much later, maybe tonight. I remember it said on the Oricon website that the weekly list won’t be out until January 6th. Public site or Youtaiju? I couldn’t find anything on the latter in the news section, unless I missed it. It was on the public website, but the text has now changed due to the daily ranking release on January 4th. Okay cool, thanks. I guess I’ll just assume it’s coming out at the normal time of day. …Still waiting on the full ranking from last week, grrrrr. I’ve been tempted to just use the extended rankings since it should be damn close enough but I’ll wait. Delayed because of the holidays. That said it went up just very recently (like an hour ago), but the text file that contains it is only active for mere minutes on the 2ch sales thread before they take it down. So now I have to wait for someone to post it to urisure before I can do the post. Do you have the data from Soundscan? No, we don’t use Soundscan except as a very rarely needed backup. They have less comprehensive coverage than Oricon and a lot less data is available from them. Do you know where to find it anyway? http://www.phileweb.com/ranking/bd-top20/379.html …is what I was going to say (the actual sles numbers are commented out in the HTML source of the page), but then the message at the top of the page reminded me Soundscan DVD/BD tracking ended last November. Oops. Despite all the speculah, the full list really was as abysmal as STALKER suggest. One nice thing about this is that it shows that except for very high sellers, we’re at the point where I could honestly keep doing this ranking with high confidence even if the full lists never got posted again. Prelims + extended rankings = we’d be pretty damn close for everything below, like, 15-20k and not awfully far off for most higher sellers. Extendeds are much more important than the full weekly lists at this point. For better or worse. I miss the days I can pretend a show sold 999 when the cut off was >1k. Ignorance is blest. 4,601 – Yuru Yuri San Hai! Now on to the next weekly full list. Heh, was just here coming to comment on that! When I scraped the extended rankings last week, that release was missing. It showed up this week though (going through this extended rankings for the week of 12/28 now), with an estimate of 471 discs. The scrape of the DVD extended rankings brings up a lot of dupes and such so not every release appears every time. Pretty annoying but they usually show up eventually. Durarara!! x2 Ten v5 DVD showed up in this week’s scrape as well, so I’ve added the DVD info for that.